A last-minute decision turned out to be a good one for Jennifer Krigbaum, who took home the Postseason Shootout contest. Krigbaum signed up for the contest less than an hour before the first games and won $50,000 for her big-time accomplishment. That decision was one of the best for Krigbaum, picking the correct roster to win the big prize. And getting in a high-stakes contest was new to Krigbaum. She was not a veteran high-stakes player like many that have won this contest past seasons. “This is the first contest I've entered with a payout over $10,000,” said Krigbaum. If you aren’t familiar, rules for the Postseason Shootout contest are pretty simple. For an entry of $125 (or three teams for $350), you select a roster from all the teams in the NFL playoffs that you think will score the most points this postseason (you can’t select more than two players from each NFL team, though). Your roster will consist of two quarterbacks, two running backs, two wide receivers/tight ends, two flex players (RB/WR/TE), a defense/special teams and a kicker. There is no draft or head-to-head games. It is a total points contest. If you finish in the top 150, you are going to win some money. First place takes home $50,000 while finishing 150th gets you $250. With those rules in place, Krigbaum setup a strategy for picking the correct roster, which turned out to be a contest-winning strategy. Krigbaum’s lineup consisted of Tom Brady, Dak Prescott, Ezekiel Elliott, Alvin Kamara, Julian Edelman, Robert Woods, Michael Thomas, Eric Ebron, Greg Zuerlein and the Colts defense. Edelman proved to be key for Krigbaum, posting huge numbers throughout the playoffs. Krigbaum edged a roster that had Patrick Mahomes and Tyreek Hill, finishing roughly five points ahead of that team. Needless to say, the Patriots/Chiefs game was a big one in deciding the outcome for Krigbaum. So now that Krigbaum is $50,000 richer, does she have any big plans for the winnings? “No plans for the winnings yet except maybe a Julian Edelman jersey,” said Krigbaum. If you want a chance to take down Krigbaum next season, sign up for the Postseason Shootout before the start of the playoffs. We’ll have links up on our site and home page. You won’t watch postseason football the same way going forward. 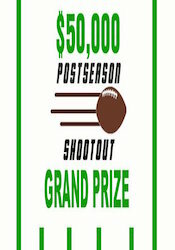 Click on this link to see more details about the contest or to sign up: www.fantasychampionship.com.